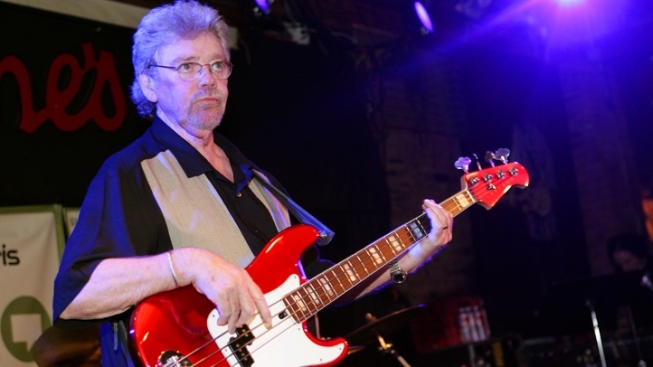 Donald "Duck" Dunn of Booker T. & the MGs contributed to such classics as "In the Midnight Hour," ''Hold On I'm Coming" and "Sitting on the Dock of the Bay." Donald "Duck" Dunn, the bassist who helped create the gritty Memphis soul sound at Stax Records in the 1960s as part of the legendary group Booker T. and the MGs and contributed to such classics as "In the Midnight Hour," ''Hold On I'm Coming" and "Sitting on the Dock of the Bay," died Sunday at 70. Dunn, whose legacy as one of the most respected session musicians in the business also included work with John Belushi and Dan Ackroyd's Blues Brothers as well as with Levon Helm, Eric Clapton, Neil Young, Bob Dylan and others, died while on tour in Tokyo. News of his death was posted on the Facebook site of his friend and fellow musician Steve Cropper, who was on the same tour. Cropper said Dunn died in his sleep. Dunn was born in Memphis, Tenn., in 1941, and according to the biography on his official website, was nicknamed for the cartoon character by his father. "He thought I would become a drug addict and die. Most parents in those days thought music was a pastime, something you did as a hobby, not a profession," Dunn said. But by the time Dunn was in high school, he was in a band, the Royal Spades, with Cropper, a group that would eventually become the Mar-Keys. Cropper left the band to become a session player at Stax Records, the legendary Memphis-based record company that would become known for its gritty soul records and artists like Otis Redding, Sam and Dave, Isaac Hayes and the Staples Singers. Soon, Dunn followed Cropper and joined the Stax house band, which would become Booker T. and the MGs. It included Booker T. Jones on organ and Al Jackson on drums and was later inducted into the Rock and Roll Hall of Fame. "I would have liked to have been on the road more, but the record company wanted us in the studio. Man, we were recording almost a hit a day for a while there," Dunn said. The group had its heyday in the 1960s as backup for Stax artists such as Redding. Booker T. and the MGs had its own hits as well, including "Hang 'Em High," and "Soul-Limbo." In the 1970s, the group's members drifted apart. Jackson was killed in Memphis in 1975 by an intruder in his home. The remaining members had a brief reunion in 1979, but Cropper and Dunn would have a sustained reunion when they joined Ackroyd and Belushi's Blues Brothers band and appeared in the 1980 "Blues Brothers" movie. "How could anybody not want to work with John and Dan? I was really kind of hesitant to do that show, but my wife talked me into it," Dunn said in a 2007 interview with Vintage Guitar magazine, "and other than Booker's band, that's the most fun band I've ever been in." Dunn also did session work on recordings by Clapton, Young, Dylan, Rod Stewart, Sam and Dave and Stevie Nicks, according to his discography. He was on Redding's "Respect" and "Sitting on the Dock of the Bay," Sam and Dave's "Hold On I'm Coming" and Wilson Pickett's "In the Midnight Hour." Dunn once said that he and Cropper were "like married people." "I can look at him and know what he'll order for dinner," he said. "When we play music together we both know where we're going." Dunn received a lifetime achievement Grammy award in 2007 for his work with Booker T. and the MGs. He is survived by his wife, June; a son, Jeff; and a grandchild, Michael, said Michael Leahy, Dunn's agent.